Pesky raindrops? Protect your skull with this smiling anatomical one. Our Skull Umbrella, featuring a very toothy grin, is sure to keep you dry and happy, in a macabre sort of way! There is 101 reasons you need this beautiful Dalmatian Lover Umbrella. It features lace and bow details with a hook style handle. It is a Sunny or Wet must have accessory for all your weather needs (Yes that�s right, this is a real umbrella and can get wet. 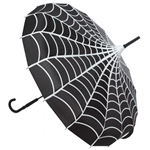 It�s not just a fashion piece it�s functional) This Umbrella will compliment any outfit or costume.